A motorway crash that led to the deaths of five people could not have been "reasonably" avoided, an inquest heard. The driver of the converted horsebox that veered off course after a blowout could not have done anything differently, an investigator said. Avon Coroner's Court heard there was no legislation requiring a tyre to be replaced at a certain age and its poor condition would not have been obvious. Richard and Elaine Evans, Audrey Hodge and Adrian Beaumont died at the scene. Mr Beaumont's partner, Rebecca Mitchell, died in hospital seven months later. The crash happened on 16 September 2017, when a tyre blowout caused the adapted Mercedes 1820 box van, driven by Michael Bakewell, to steer to the right and crash through the central reservation barrier. He collided with two cars travelling in the opposite direction between junctions 14 near Falfield and 15 near Almondsbury. Forensic collision investigator PC Sharon Little told the inquest the vehicle was "found to have no significant defects before the collision that could have been considered dangerous". She said: "The great age of the tyres were a significant factor in how the tyre burst. There was nothing readily apparent that the tyre was close to bursting. "It was not possible for Mr Bakewell to realise there was a problem that day. Mr Bakewell could not have done anything to avoid the tyre blowout or the steering." She added that there was nothing the drivers of the other two cars could have done to avoid the collision, which happened less than a second after the van went through the metal barrier. PC Little said the Subaru Forester, carrying driver Mr Evans, 66, his wife, 62, and her mother, Audrey Hodge, 84, was "torn apart" and left "almost unrecognisable" following the collision. 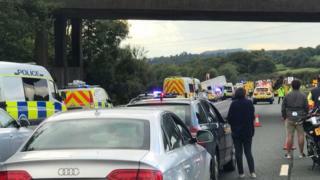 She said the Seat Leon carrying Adrian Beaumont, 46, his partner, Rebecca Mitchell, 42, and their 12 year-old son and 10-year-old daughter, from Bristol, was forced off the road by the van and overturned down an embankment. Mr Beaumont died at the scene, while Ms Mitchell suffered serious brain injuries and died at Southmead Hospital seven months later. Their children are still recovering from their injuries. In reaching a narrative verdict, coroner Maria Voisin concluded the five deaths were caused by a collision when the van's tyre suddenly deflated. "The front offside tyre suffered a blowout and a sudden and instantaneous deflation. "The tyre was 18-and-a-quarter years old and had suffered structural deterioration because of ageing," she said. She said she was "mindful" to make a report that could have influenced future legislation on tyre conditions, but said she was reassured "steps are being taken" following evidence from a government representative.